We pay attention to what we ate last year, what fits with the performance themes. 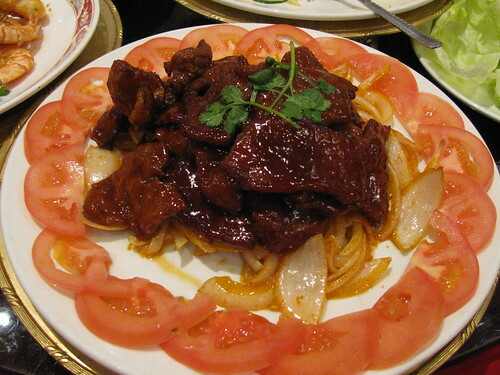 January 31, will welcome the Year of the Horse – and NO – we will not have horse meat. But Horses will fit into the literary theme… How about some Beef? Half the dishes are vegetarian including: turnip cake appetizer, vegetarian hot and sour soup, lettuce wrap, buddha’s feast + efu long life noodles. Meat dishes will be fish, chicken and a beef dish, + traditional haggis. 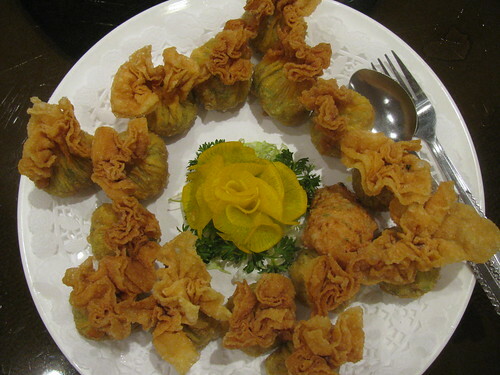 Our specialty appetizer items are deep-fried haggis & shrimp won ton, and haggis & pork su-mei dumplings… but we are considering bringing back spring rolls in place of the bbq pork. 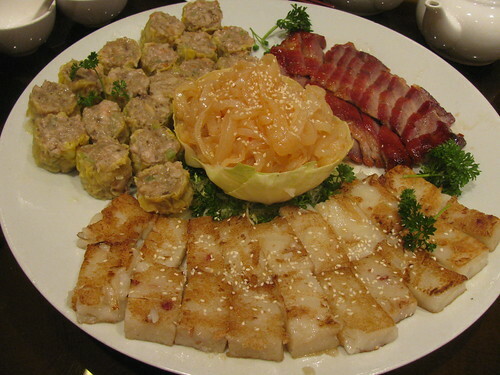 This is the appetizer platter: Spicy jellyfish (center), , Lo-Bak-Goh turnip cake (front), BBQ pork (right) and haggis & pork shu-mei dumplings (left). Delicious! My great-grandmother always used to make the turnip cakes for me – to this day, they are one of my favorite dim sum dishes! Our famous Haggis & shrimp Wonton dumplings! Utterly tasty…. It is one of our mentor Jim Wong-Chu’s favorite items on the menu that he looks forward to tasting each year. Last year, we had accordionist Lewis Kane, fresh from Scotland attend out taste-test dinner. We asked Lewis to try one… to see if a real Scottish person would eat it. And… he LIKED it…. he said it was real good… and that they should do this in Scotland! HA! Score one for Canada! 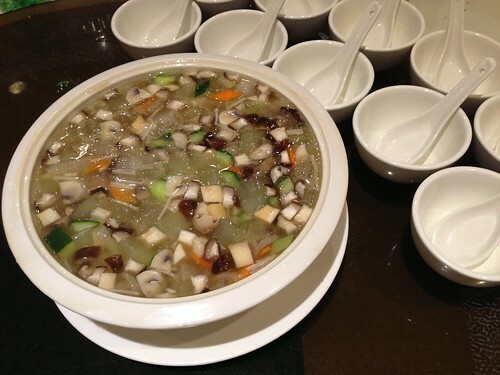 Last year we had Winter Melon soup… would be a staple if winter melons grew in Scotland. Sublime in flavour, delicately balanced with mushrooms, cucumbers, carrots and lots of other good things. But… for 2014, we will return to a traditional Hot & Sour Soup – because the word “Sour” is very similarly spelled to the word “soul” – and good soul food always feels filling… and we are featuring author Janie Chang, whose new book is titled “Three Souls” – so we will have a Hot and Sour Soul Soup. Nice alliteration, eh? 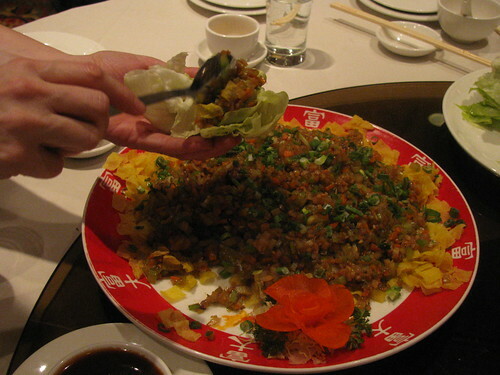 Here is the best way to eat haggis… take a spoonful of haggis and add it to the Chinese vegetarian lettuce wrap. Very tasty – just like a hamburger without the bun. Remember to put lots of Chinese Hoi-sin bbq sauce inside. 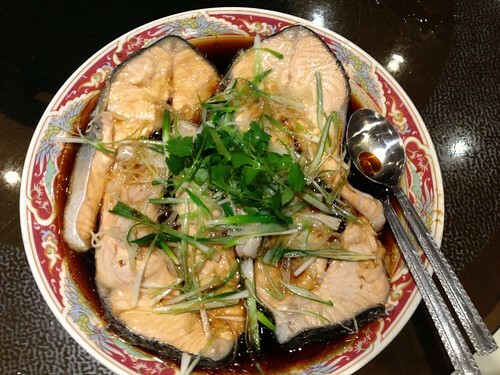 Last year we had Steamed salmon – flavoured with hot oil and ginger, and topped with chives and cilantro. This was one of the original dishes that I had personally prepared at the original Gung Haggis Fat Choy Dinner backin 1998. So mouth-watering good… it melts in your mouth. Buddhist’s feast is a traditional New Year’s dish, with lots of vegetables and bamboo shoots and mushrooms and Chinese funghi. We figured if we are making Chinese people eat haggis, the Scottish people can eat Chinese funghi. Afterall… it is considered a delicacy in Chinese cuisine. 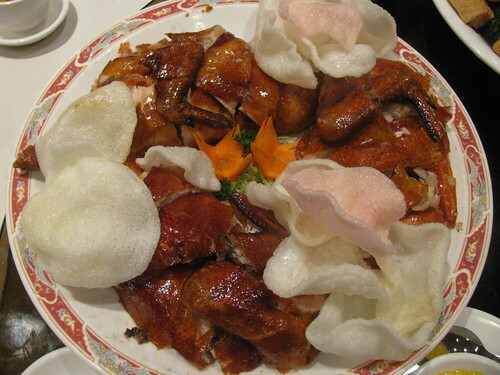 This is traditional crispy skin chicken, served with shrimp chips. They are always very tasty – and not greasy like American style deep-fried chicken from KFC and elsewhere. E-fu noodles… these are lovely textured egg-based noodles, and also traditional at Chinese banquets. Not the regular chow mein noodles many people associate with Chinese take-out. This is one of my favorite dishes, and the long noodles symbolize good wishes for long life. And then there is dessert…. need we say more than two words? Mango pudding. But please note – menu is subject to change… as availability and freshness is important to us. Love Gung Haggis! First generation Canadian and a graduate from Edinburgh University, I’ve been going every year since 2006. I hope to be bringing a table of my fellow alumni of Edinburgh university. Last year I launched an alumni group in Vancouver. Thank you Grace! It’s people like you who help inspire us and keep us going! It would be fun announce a full table of Clan Edinburgh University! My cousin’s son is going there now, and my friend’s parents both went there for Medical School, which is how they met! The haggis is a national dish of Scotland although some say that the ancient Romans were the first people known to have made haggis-type products. At any traditional meal in Scotland, you can expect to see this dish served, as we were at our Southern Highlands hotel.